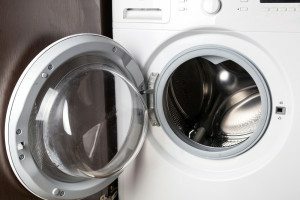 Calling an appliance tech to repair your dryer door may not always be necessary. In some cases, the problem has more to do with how you use the appliance than the existence of an actual mechanical problem. But sometimes the issue needs the attention of an experienced repair person. Read on for some helpful hints for identifying which is which. This is the most commonly reported problem with clothes dryer doors, even for relatively new models. Like many home appliances, dryers are equipped with a safety switch that prevents the unit from operating unless the door is both closed and latched. Sometimes, however, the door seems to magically pop open mid-cycle, shutting the motor off and (too often) tossing your socks out onto the floor. Before you start propping it shut with a chair or calling for repair, try running a smaller load. The weight of a huge pile of wet clothes is often sufficient to pop a sensitive electronic latch. This problem may be the result of one of several different issues. The most common is that the door’s hinges have become bent or tweaked, typically from placing excess weight on the door itself (never drape wet towels or clothes over an open door!). The inside portion of the door can slightly warp or bend as well, causing the latch parts to become misaligned. Both of these issues can sometimes be solved by adjusting a few screws and maybe adding a shim behind the hinge. In some cases, the problem may be the latch mechanism itself, which is not a do-it-yourself repair. Many models require the removal of the front panel to access the latch. Because the door’s mechanisms are connected to the safety switch, working on them involves the manipulation of electrical wiring and sensitive electronic components. Unless you want to zap yourself or void your manufacturer’s warranty, it’s best to let a pro handle this one. You’ve opened the door mid-cycle to check your clothes and found them to be a bit damp still, so you close the door and turn the machine back on to finish the load … and nothing happens. You may have blown a thermal fuse. This fuse acts as a safety mechanism for preventing fires, cutting power to the motor should your appliance overheat. Sometimes opening the door can cause a spike in the internal temperature that blows the fuse. You’ll have to have the fuse professionally replaced; however, you can avoid a repeat of this problem by keeping the vent and lint trap free of debris and blockages at all times. These can cause a dangerous heat buildup that may actually start a fire, which is much worse than a blown fuse! Of all the dryer problems you might encounter, the door probably seems like the least troublesome component. Unfortunately, it’s the most vulnerable part of the machine and the first to wear out. 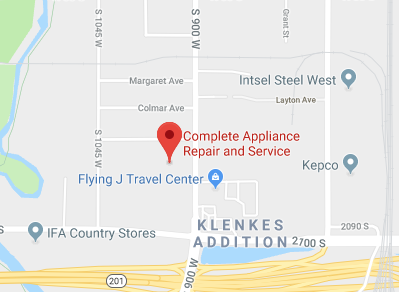 If you’re in the Salt Lake City area and can’t seem to identify or correct the problem on your own, give a call to Complete Appliance Repair. We’ll dispatch an experienced technician in time to handle your dryer door repair. This entry was posted in Blog and tagged clothes dryer repair, dryer door repair on November 30, 2015 by admin.